Finally found some time to play with some stamps and get inky. I made the card below using stamps from Just For Fun Rubberstamps and distress ink. I heat embossed the image using clear embossing powder. Then inked up the card stock using mowed lawn distress ink. I used the same stamp on the white card stock, this time stamped it with the same color of distress ink. Layered with some yellow and wasabi card stock and finished the card off with brads and some gold cord. hope you have a fun filled weekend!! Absolutely stunning Ellie with the green and white. Touches of gold really makes the design pop. Stunning Ellie and the white resist has worked really well, so often it dulls with the ink but this looks great. 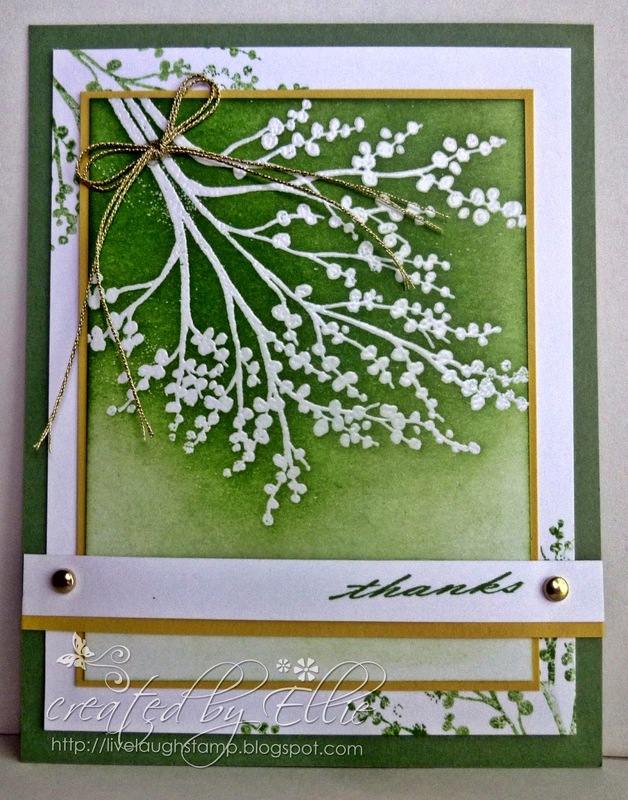 Beautiful card, love the results using the distress inks and the layout. Thanks for joining the SweetStamps challenge this week.